In shady borders, flower beds, window boxes and containers. 'Candidum' (white, green veins), 'Florida Cardinal' (red with green), 'Carolyn Whorton' (green with pink blotches, red veins), 'Fannie Munson' (pink with some green, dark pink veins), 'Freida Hemple' (red with green), 'Pink Beauty' (green, pink blotches, red veins), 'Postman Joyner' (red with green, red veins), 'Red Flash' (bright red with dark green, red veins), 'White Christmas' (white with green, green veins) and 'White Queen' (white, some green and deep red veins). 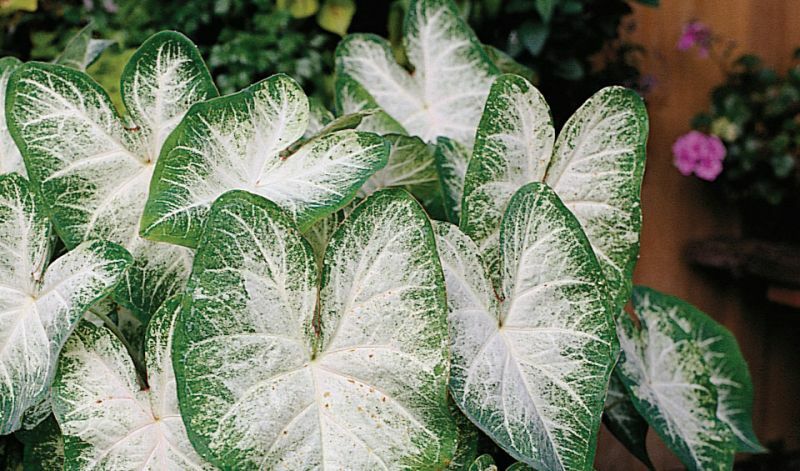 Caladiums are indigenous to Brazil and neighbouring areas of South- and Central- America where they grow in open areas of forests and along banks of rivers. They have been in cultivation in Europe since the late 18th century.